SCP-2217. The island of ██████ is visible in the background. Special Containment Procedures: SCP-2217 is to be closed off to the public, with Standard Cover Story 419 (Private Property) being enacted to prevent trespassing. A meteorology center has been established near SCP-2217 to effectively predict lightning strikes in the area, as well as other phenomena that contribute to the formation of anomalies on SCP-2217. Individuals attempting to breach the perimeter of SCP-2217 are to be detained and interrogated. Any individual who is found to have connections to GOI-004A ("The Broken Church") are to be detained indefinitely, or terminated if they have been exposed to one of the contagious SCPs related to GOI-004. SCP-2217 is currently under attack by forces from the Broken Church, and anomalous activity on SCP-2217 has increased exponentially. In the event that a member of Foundation personnel is struck by lightning on SCP-2217 and survives, they are to be immediately detained and taken to Site-2217-Alpha in Sicily for indefinite containment. Special Containment Procedures: Retrieval and research into possible uses of SCP-2217 is currently Priority Alpha for the Foundation. All members of GOI-004 ("The Church of the Broken God") in Foundation custody are to be interrogated using experimental compound AMNESTY-C-A, a derivative of Class-A Amnestics. A partnership with the Horizon Initiative has allowed the Foundation near-unlimited access to scripture related to the Church of the Broken God, which is being reviewed. If events occur that correspond to Chapters 20-27 in the Book of Disassembly, immediate action is to be taken, and the Lake Baikal region is to undergo immediate Penzance treatment. Special Containment Procedures: SCP-2217 is currently undergoing weaponization in order to prevent Scenario XK-610-Ω from occurring. Foundation, Horizon Initiative and Global Occult Coalition assets (Codenamed "Triumvirate") are currently collaborating with Broken God members to attempt to summon UAE-Aleph-15 as a further countermeasure to the aforementioned XK scenario. Scenario XK-610-Ω will be triggered on 12/31/2019. The secrecy directive will not apply to any actions taken to prevent Scenario XK-610-Ω on this date. 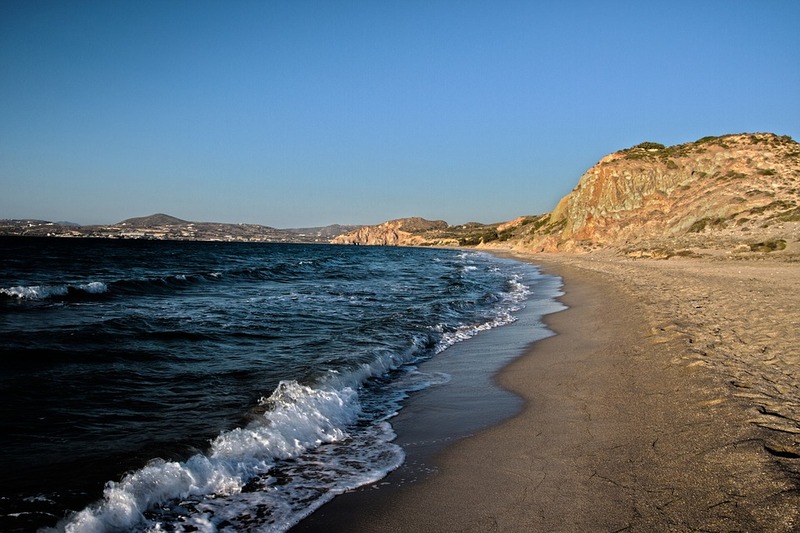 Description: SCP-2217 is the entirety of the beach on the island of [REDACTED], Greece. The sand of SCP-2217 is composed of non-anomalous silicates and calcium compounds, as well as several cationic metallic particles, which hold their charge despite being grounded; these particles partially act as a catalyst for the anomaly related to SCP-2217. SCP-2217 also houses a small silicate cliff at the northernmost end, the interior of which is affected by the anomaly. Natural processes that take place in SCP-2217, including the decay of sea life that washes up on it, erosion of the shoreline, lightning strikes (made more frequent due to the aforementioned cation content), and other weather conditions, result in the creation of structures and devices that are seemingly artificial in nature, collectively designated SCP-2217-A. Several forms of machinery, ranging from simple timepieces to complex automatons, which are constructed from fulgurites and are often found buried under the sand of SCP-2217 following lightning strikes. Apart from their circumstances of creation, these items do not have anomalous properties, and are fully functional. Jewelry evidently fashioned from sea glass and other waste products, such as discarded lightbulbs, hulls of ships, and animal bones. Jewelry often resembles or bears religious iconography used by the Broken Church. A model of a large city, designated SCP-2217-A1. SCP-2217-A1 is located in a grotto within a cliff on SCP-2217, accessible only via an underwater entrance. Structural elements in SCP-2217-A1 appear to correspond to an unknown Ancient Greek city, with a temple bearing the word "Κύθηρα"1 SCP-2217-A1 bears several forms of religious iconography related to all three factions of the Church of the Broken God. However, despite the apparently Greek architecture, geographical features more closely resemble those found near Lake Baikal in Southern Siberia, Russia. Analysis appears to show that SCP-2217-A1 was carved entirely by natural forces such as tidal erosion. SCP-2217 is considered a holy site by The Broken Church, a splinter faction of the Church of the Broken God. A piece of scripture used by the religion, the Book of Rites, describes SCP-2217. The Boy looked out at the ocean with his family, and he saw fire rain down on it from God himself. God said to the Boy, "This is my workshop. It is where I make many wonders." "The lightning is my hammer, the Earth my anvil, the sand my ingot." "Come, boy. Come into my workshop." And the boy went, leaving his family behind. The Boy's family wept, thinking that the boy was going to his death. They did not hear God like the Boy did. On God's anvil, the Boy spread his arms and cried to the sky. "God! I am here! Show me your wonders!" And God did. He brought His hammer down on the boy, smiting him and tearing him asunder. He, like his God, was now Broken. But the Boy did not die. Instead, he became one of God's first children, forever marked. This mark was not a visible one. It was in his mind. The Mark was the Blueprint of God itself. But, it was only a fraction of a fraction of the true Blueprint, but he knew, one day, it would smite the Flesh. The Boy called out to his family, "Come and See the Wonders of God! Let him smite you onto his anvil, and you shall be struck into a new form." And so, his family saw the power of God. Incident 2217-14: On 1/01/2014, a magnitude 4.1 earthquake occurred on SCP-2217, with the epicenter being concentrated around the grotto where SCP-2217-A1 is located. A robotic probe was launched and guided into SCP-2217-A1's cavern, where it was discovered that a large structural shift had taken place. Several of the buildings appeared to be in the process of being consumed by a substance resembling pahoehoe lava. From this mass, several beings resembling individuals infected with SCP-610 were storming the town, destroying buildings and devouring humanoid figures; no individual figures were seen in SCP-2217-A1 prior to this incident. Incident 2217-35: Starting on 12/12/2017, several members of the Broken Church have attempted to attack the island where SCP-2217 is located, attempting to "reclaim it for the Church". Experimental magnetic weaponry developed for the Esoteric Warfare Unit is currently being used to repel the attacks. However, there have been reports of Foundation personnel defecting after being struck by lightning on SCP-2217, invariably stating that "God needs to be reassembled". These personnel are to be detained immediately. Incident 2217-42: On 7/28/2018, a large group of Broken Church members, several of which were anomalously augmented, attempted to storm SCP-2217 and the Foundation outpost located on it. Broken Church adherents were reportedly accompanied by members of GOI-004B (Cogwork Orthodox) and GOI-004C (Church of Maxwellism), despite reports of intense animosity between these groups. Oh disassemblers who call themselves a Foundation: what are you a Foundation for? If you are a Foundation for life, then you will let us keep this land. For the flesh is coming, and only we can stop it. We need to bring our God back together immediately, or else you will all perish. WAN spoke of the coming of the flesh, Horrors 25:7-12.2 And now, it is time. If you are a Foundation for life, you will not let this happen. You will let us defeat the flesh. Several other messages followed, demanding the relinquishing of SCPs related to the Church of the Broken God. As of 8/01/2018, all Foundation personnel on SCP-2217 have defected. As of 8/05/2018, SCP-2217 remains uncontained. Observational Report 2217-04: Since failure of containment of SCP-2217, Foundation satellites have been observing SCP-2217. Images appear to show members of the Church of the Broken God drawing symbols in the sand. The Triumvirate, a joint task force with the Horizon Initiative and Global Occult Coalition, has found that these symbols correspond to a large-scale summoning ritual used to revive UAE-Aleph-015, or "The Broken God/MEKHANE/WAN". Plans for a large-scale invasion of SCP-2217 are currently underway. Incident 610-2217: On 1/01/2019 at 00:00 local time, a large earthquake occurred in the Lake Baikal region. This seismic event corresponded with a large influx of SCP-610 instances, which started attacking the perimeter of the containment area. Foundation forces suffered high casualties, and a near containment breach of SCP-610. However, the breach was stopped by a sudden appearance of several augmented members of the Church of the Broken God, who proceeded to assist Foundation forces in containing the breach. The Church members had evidently been waiting in the area around Lake Baikal for at least fifteen days prior to the breach, later claiming that "God had told them to come to [The Foundation's] aid." The breach was fully contained when a large-scale electrical discharge occurred on 01/04/2019, destroying all SCP-610 instances within a 5km radius of its point of impact. Non SCP-610 lifeforms, including Foundation personnel, caught in this area were not affected, except for the total destruction of the SCP-610 contagion in their system. Satellite photography shows that this discharge originated on the island where SCP-2217 is located approximately twenty minutes prior to impact. Following this, a video message from Robert Bumaro, the leader of the Broken Church, was received by all Triumvirate leaders, including O5 command, the Director of the Global Occult Coalition, and the Horizon Initiative's Tribunal. It's not too late, you know. This is our world, too. We want the Flesh to die as much as you do. And we can help you; we can help each other. Come to the Anvil. We will talk, and we can save this world. Addendum: 2217-Thaumiel: On 5/14/2019, O5 Command unanimously voted for temporary collaborative measures with GOI-004, in order to prevent an XK-Class Scenario. SCP-2217 has been reclassified as a Thaumiel-class anomaly, and will be used to prevent Scenario XK-610-Ω. During the prevention of this scenario, all secrecy protocols will be rescinded, with a high probability of leading to an LV-Zero "Lifted Veil" scenario; this has been deemed a necessary risk. To help the public adjust in the event of a possible LV-Zero Scenario, the Triumvirate has created Project ENNUI. Project ENNUI will use a combination of ENNUI-5 Amnestic and gradual civilian exposure to harmless, E-Class anomalies, as well as anomalies that have been given an -EX designation but have yet to be released to the public. As of 8/25/2019, SCP-2217 remains under Triumvirate control, and Project ENNUI is operating at 45% effectiveness. 1. Kythera. This name is shared with an island in the Attica region of Greece, approximately [REDACTED] km from SCP-2217. The word "Kythera" appears in certain scripture related to the Church of the Broken God. 2. From the Maxwellian Book of Horrors: 7 And so, in the cold land, the Flesh spread its horrors throughout Kythera. 8 And WAN banished them with His hammer, but it was too late. Kythera had fallen. 9 WAN spoke mournfully, and His Signal was heard throughout the land. 10 'The Flesh cannot truly die. When it comes again, Kythera will once more fall. 11 Five years shall pass after the end of Kythera, and the Flesh shall come again. 12 When it does, another year shall pass, and the great battle will begin."